Teaching common v. Proper nouns can be a challenge. Here are a few tips for Teaching Common v. Proper Nouns and a free worksheet to help your students understand this concept. Nouns are the basic unit of parts of speech. The simplified definition is a person, place, thing, or idea, but how do we help our kids understand the difference between common and proper nouns? Common nouns name a general person, place, thing, or an idea. There are three easy ways to figure out whether or not something is a common noun. First, if you can put an article in front of the word (a, an, or the) as in “the bird”, it can be a noun. If you can make a word plural as in “birds”, it can be a noun. Also, if you can add a possessive pronoun in front of a word (my, his, her) as in “her bird”, it can be a noun. If any of those conditions work, then your word is a noun. Proper nouns are also people, places, things, or ideas, but they name a specific common noun. Proper nouns are always capitalized. For example, bird is a common noun but Tweety (a specific bird) is a proper noun. Car is a general word for a vehicle, but a Ford Mustang is a specific brand of a car. Like any English rule, there are some tricks to proper nouns. A dog is a common noun, and a poodle is a specific dog, right? However, you would not capitalize poodle as it’s still a general thing (animal). If it has a modifier that focuses on a specific country, for example, French poodle, you would capitalize the adjective because it refers to a specific country. 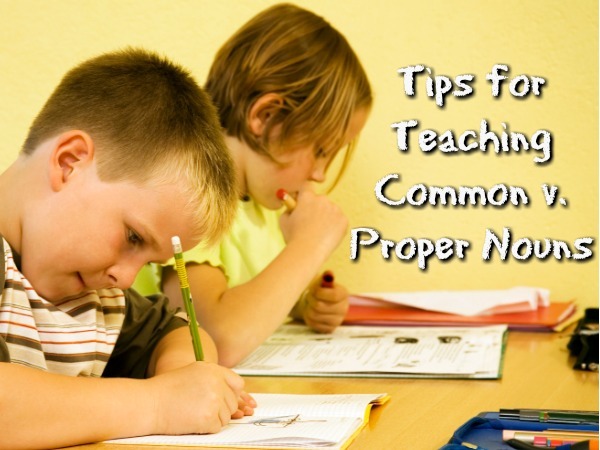 Here are a few examples to help your child differentiate between common and proper nouns. Example sentence: Last summer, my family took a vacation to Disney World, our favorite amusement park. Disney World is a specific park. Example sentence: Pablo Picasso was an artist known for his unique style of painting. Pablo Picasso is a specific artist. Months of year and days of the week are always capitalized (i.e. January, Wednesday). Seasons are not capitalized (i.e. summer). Adjectives that denote origin or place in front of common nouns are capitalized, but the noun is not (i.e. German shepherd, African violet). The first word in a sentence is always capitalized regardless of whether or not it’s a proper noun.Helping your child figure out the differences between common and proper nouns starts with being able to identify nouns. Understanding simple ways to test whether or not something is a noun will lead to better identification of the specific types of common nouns or proper nouns. Share these tips to help your child become a noun expert! Grab your FREE Nouns Worksheet Below! !